Bought on a whim because it was beautiful, it has consistently been the most underused of all my planners. While some may be content with having planners just looking pretty on their shelves, I like all my planners to have a purpose. Partly, this stops me from buying ALL THE PLANNERS and partly it’s because I don’t like feeling like something is going to waste. 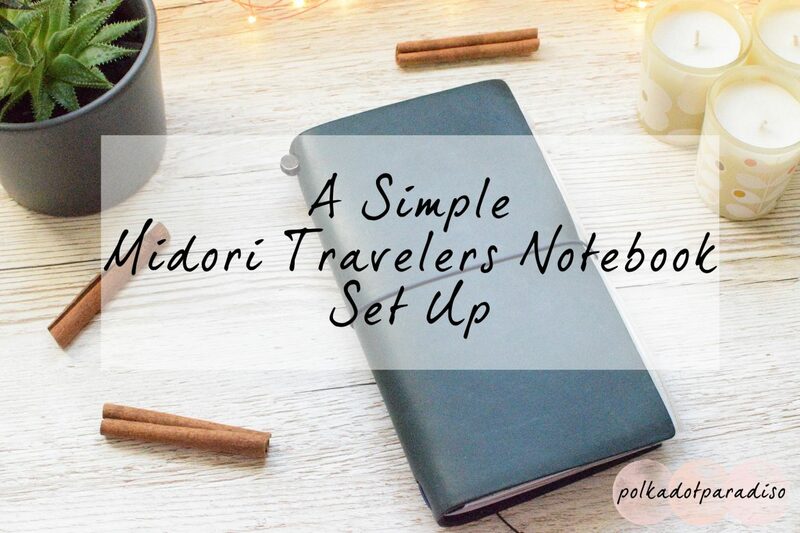 Depending on how long you’ve been reading this blog, you may have seen previous set up posts for my Midori. From setting it up as a blog planner, to using it for bullet journaling. None of these set ups really stuck sadly, and I quickly moved on to new ideas. I’m refusing to give up on my TN though. There’s just something lovely about a stuffed TN and I could spend hours looking at images on Pinterest or Instagram. Travelers notebooks are very in right now. Everyone is swapping their rings for them. Because I’d been itching to use some Planner Society goodies back in the summer, I decided to re set up my Midori. I’m not really very good at using journaling cards and this just looks all a bit clashy in hindsight. The insert here that I covered with some Planner Society paper is one that I bought from Etsy and cut and put together myself. These weekly inserts are from a shop called JIDesignStudio and were super easy to use. I much preferred this to trying to use printable Filofax inserts as there was very little cutting of pages required. Just one cut and then they could be folded in two. The only problem with these inserts? That isn’t actually a problem with these inserts, it’s a problem with me. I didn’t think about how I was going to make the booklet. I don’t own a stapler big enough to staple the booklet together. Instead I had to go old school and sew it together (you can see the yellow thread on the first picture). From here the set up was pretty basic. I had a plastic wallet, a list book from The Planner Society and my travel journal. That’s one thing I always consistency use this Midori for – journaling while on holiday. Between the small size and the ease of stuff mementos in, I never go on holiday without this. This new set up was largely centered around the new weekly insert. It was supposed to be a new gratefullness/mindfulness log for me. Sadly though, I never really got into the swing of so it went back to it’s place on the shelf. Late into the summer when I was planning my new planner set up I rejigged my planners to have more focus on my business. One of the things that came out of this planning session was the need for more weekly planning space. Specifically, I needed more space for blog and shop planning. I didn’t want to move to daily inserts in my Filofax as I like my week at a glance and also didn’t want to move out of my Filofax and into a bigger planner. Instead I decided to switch up my Midori set up yet again for day to day blog and shop planning. I needed new inserts for this and so had a browse around Etsy. I fell back to a shop I’d purchased from before; Travelers Times. I like Travelers Times inserts because they’re UK based, have reasonable prices and do a great selection of different inserts. This weekly planner is just £2.50 in standard size. With 34 pages you get over half a year in each of these booklets. It’s available in either grid or blank but I write better on a grid. It has simple columns for each day and an extra for notes – perfect for any weekly trackers or to dos. Each box is just under 5cm wide so while you can use your weekly sticker kits in here, they won’t fill the boxes. Next up, I got a monthly insert. Again, just £2.50 for this insert that has 34 pages. I didn’t have a specific use for this insert when I bought it, but it just feels wrong to set up a planner without some monthly pages. Obviously I needed a dot grid insert and at just £1.25 this was a bargain. I wanted that I could use for my weekly planning, but that I could also carry around. I hate coming up with a blog post idea and not having anywhere to write it down. In my monthly I took the opportunity to use the month tabs that I’d been hoarding for ages. Yes they’re wonky, but I still love how they look. I didn’t like writing the dates and stamping the month so I made some stickers for next time. This plastic wallet has moved around a bit since the set up. Getting it to feel secure in the TN has been tricky. I did have it at the back of everything but found it moved way too much. Instead I just have it wrapped around my weekly insert and it doesn’t move around as much. There isn’t lots in the front pocket as yet. This is more for popping any cards I know I’ll need that don’t fit in my purse when I’m out. Next up is my weekly insert and I started off keeping these spreads quite simple. As I’ve gone on though, I’ve tried to make them look prettier. I love how much space there is here. I wanted something where I could easily write a list of stickers to make, or blog posts to write and I’ve got it. I’ve also been utilising little habit tracker stickers to keep on top of my daily tasks. Next is the second part to the wallet and this is for keeping my stickers in. I’ve got date stickers in here and some random Planner Society stickers for decoration. Finally for inserts, is my notes insert. This has been great for writing notes or brain dumping my to do list when I’m away from my desk. Is the set up working? I kept this nice and simple and it’s really working. There’s a little bit of decoration here and there but on the whole it’s pretty functional. Because I had a clear idea in mind when setting this up – to make me more productive with the shop and blog it really helped. I was so totally focused on getting something pulled together so I wouldn’t be surrounded by post its of stickers to print or photos. I didn’t get hung up on making it look pretty or Instagram worthy. I’ve not been carrying it with me everywhere just yet, but when I have it’s been invaluable for capturing ideas and notes. The weekly planning has been the biggest win though. I plan my work week on a weekend and leave it open throughout the week. It means whenever I have a free evening I just glance at it and see what’s outstanding for this week and then get on it with it. Anything work wise I need to do is all captured in that insert. Additionally, I now have more space in my personal Filofax whereas before I was frequently unable to fit everything in. Now this set up is working, I will now go back and probably pretty it up a little bit. Travelers Notebook kits are all the rage at the moment so I might just pick one up and give my Midori a little makeover. If you’ve got a TN I’d love to see how you set it up – please drop me a link in the comments below!